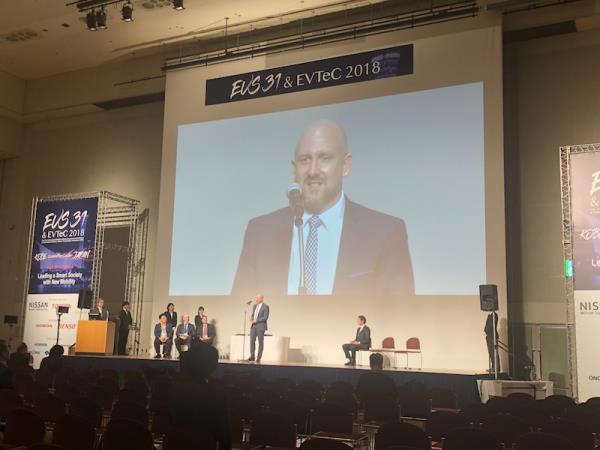 The 31st Annual Electric Vehicle Symposium and Exhibition was held in Kobe, Japan on 3 October 2018. This year, the Scottish city Dundee was awarded the International 'E-Visionary' Award, by the World Electric Vehicle Association. Dundee City Council operates the highest number of electric vehicles (EVs) of any local authority in the UK and won the award due to its continued dedication to sustainable transport. Dundee's efforts to drive EV uptake include promotional campaigns, such as 'Drive Dundee Electric', which encouraged a 33 % increase in the number of EVs in Dundee, alongside incentives, such as free parking for EVs. '[Dundee's] efforts and achievements within e-mobility are numerous, and I must commend the level of positive enthusiasm that this particular city has shown. We hope that you continue to share your experiences with the same enthusiasm', stated Espen Hauge, President of AVERE. Dundee has also built close relationships with neighbouring cities to support the expansion of charging infrastructure in the region and to drive engagement with EVs across Scotland. Looking to the future, Dundee aims to develop its investment in sustainable transport further, and is planning to implement a Low Emission Zone by 2019. (First issued by AVERE on 08/10/2018).